"We continue to believe in the power of ownership fueled by fair loans." Through our network of credit unions, we provide fair and affordable financial products and services that help members build wealth, repair credit and achieve their financial goals. In 2016, an auto accident left Hogan Van Sickle of Charlotte, NC completely paralyzed. The 36-year-old is now confined to a wheelchair or bed. As part of her condition, Ms. Van Sickle is susceptible to developing pressure sores on her body, causing pain and increasing infection risks. 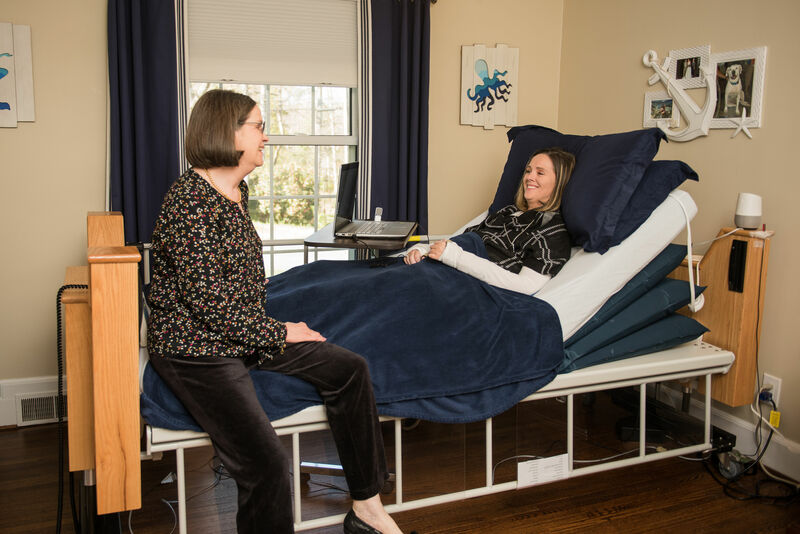 Hogan's mother learned about a motorized bed that can be operated by voice controls and programmed to turn a patient automatically at night. Such beds are expensive, but a Self-Help CU loan made a purchase possible. The family says the new bed has been life-changing. In 2018, Self-Help CU launched a collaboration with the NC Assistive Technology Program to promote a new loan for eligible borrowers needing to purchase equipment and technology that assist persons with disabilities. Flooding in Lumberton, NC in September 2018. Last year natural disasters inflicted enormous devastation in communities served by Self-Help on both the East and West Coasts. In California, members served by Self-Help Federal CU branches in Chico and Biggs were directly impacted by the Northern California wildfires. 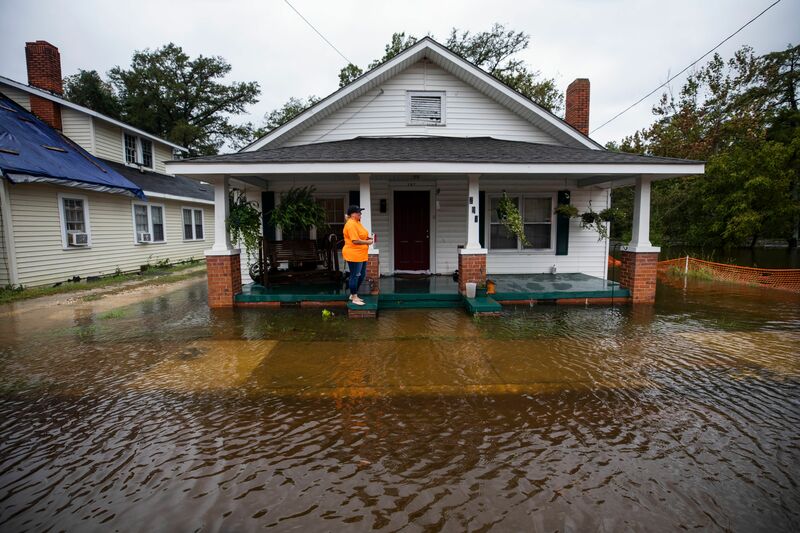 In North Carolina, two hurricanes damaged and flooded Laurinburg, Kinston and Wilmington, areas served by Self-Help CU. Self-Help responded quickly to provide temporary relief to eligible members. In the four months following the hurricanes, more than 60 members received consumer loan modifications that deferred their payments by one or more months. More than a dozen Self-Help CU and Self-Help Federal CU members took advantage of a disaster relief loan to pay for hurricane- or fire-related expenses and to offset cash flow interruptions due to lost work. 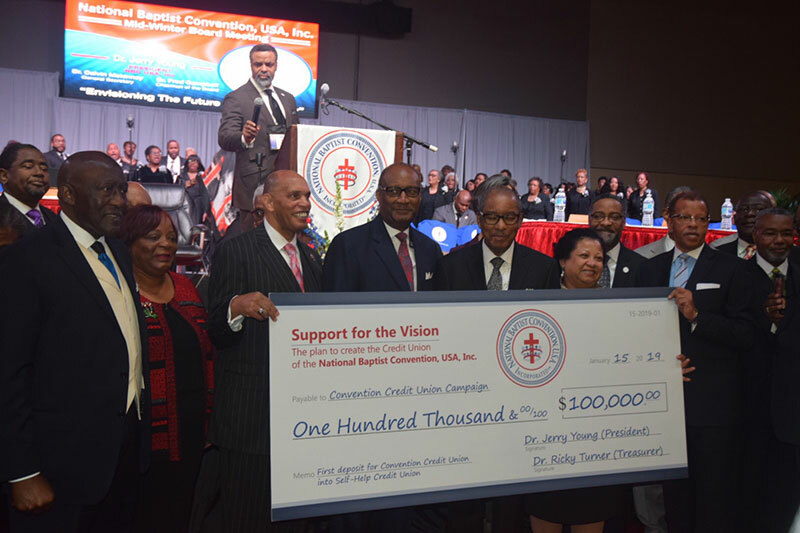 In 2018, America's oldest and largest African American religious convention, the National Baptist Convention, USA, Inc. (NBC), selected Self-Help as a strategic partner in the NBC’s initiative to create its own credit union. The Convention-founded credit union will serve NBC’s 7.5 million members and 31,000 member churches. The initial phase of the campaign, expected to run through 2021, includes deposit-raising, membership development and capacity building, with support from Self-Help. Self-Help CU is serving as the depository institution until the NBC wins regulatory approval to accept deposits. We are delighted to be part of this start-up and to continue a valued partnership with the NBC. Celebrating the launch of the deposit-raising campaign by the National Baptist Convention, USA, Inc.
Self-Help CU's branch in Greenville, SC (formerly CommunityWorks FCU). Last year we merged with two credit unions in South Carolina: Palmetto Trust Federal CU in Columbia, and CommunityWorks Federal CU in Greenville. 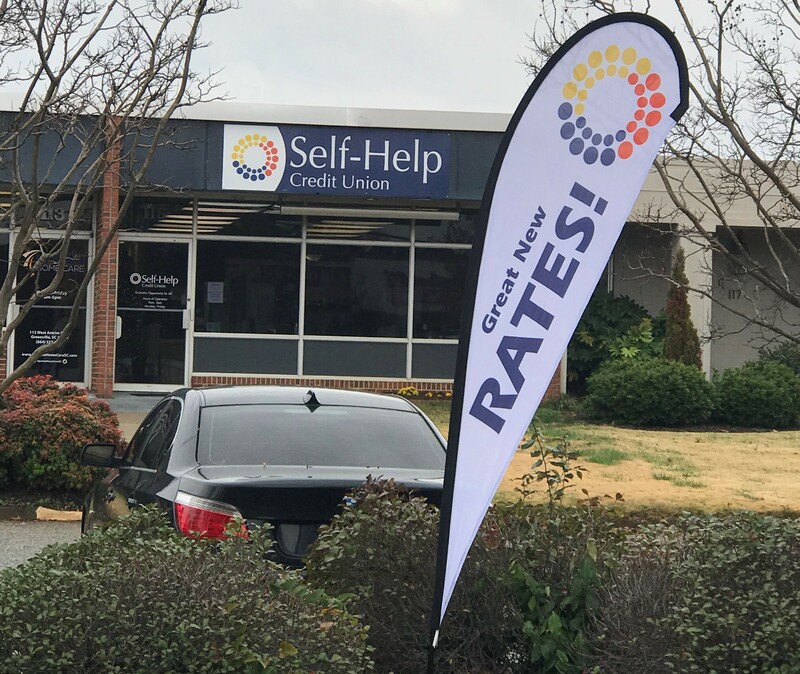 Together, the two credit unions increase Self-Help CU’s membership by 3,700 and bring a trio of branches in the Palmetto State. Palmetto Trust was founded in 1953, serving local federal employees in a diverse, growing community. CommunityWorks, chartered in 2014 by a nonprofit of the same name, was started as an alternative to predatory lending for Greenville residents of modest means. The leaders of both Palmetto Trust and CommunityWorks were seeking a strategic partner that could help them expand product offerings, including home loans. We appreciate their vote of confidence in Self-Help’s ability to strengthen service to their members. Last year represented a big milestone for Self-Help Federal CU as the credit union celebrated 10 years of service. When Self-Help Federal CU received its charter in 2008, the global recession had a devastating grip on the nation. California was losing community-focused credit unions with years of service in underserved areas. In establishing Self-Help Federal CU, we set out to build a financially strong organization that could partner with these credit unions and continue their mission of providing affordable loans and expanding economic opportunity. Today, Self-Help Federal CU serves 74,000 members in 27 branches: 17 in California, nine in Illinois, and one in Wisconsin. The institution has $1.1 billion in assets. Self-Help Federal CU's staff in Modesto, CA. 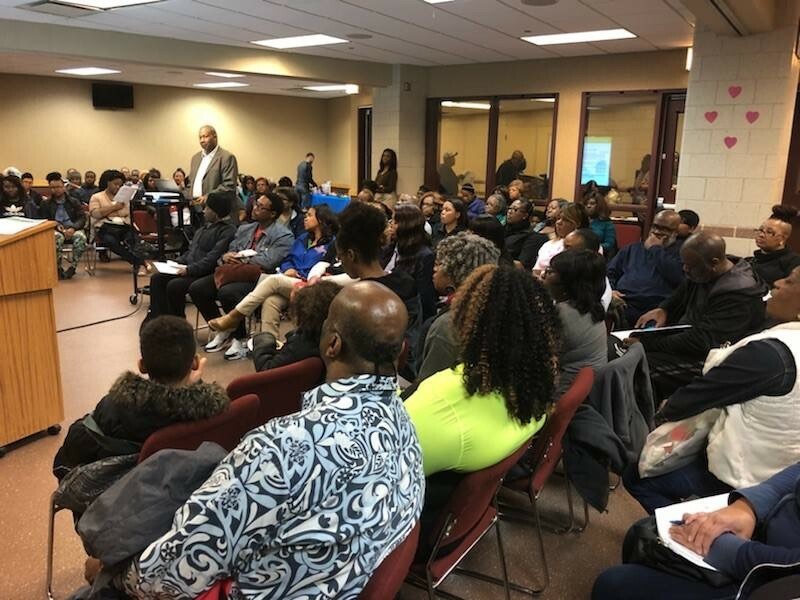 In 2018, Seaway, a division of Self-Help Federal CU, presented home buyer readiness workshops to more than 200 Salem Baptist members and local residents. See a success story here. With 15,000 members, Salem Baptist Church of Chicago is one of the largest African American faith communities in Illinois. The 34-year-old church ministers through worship and community outreach on the city’s South Side. Seaway, a division of Self-Help Federal CU (also located on the South Side), is partnering with Salem Baptist to offer financial capability workshops. These free sessions cover home loans, debt management and other practical information to help attendees prepare to become homeowners. Self-Help CU members in Apopka, FL have a brand new branch to call home. The construction of this new building followed the 2016 merger between Self-Help and Community Trust Federal CU. The 2,300-square-foot branch serves 2,200 members, along with another branch located a few miles away in Pierson. “My wife’s dream was to have a restaurant because she loves to cook and everybody always has good things to say about her food. 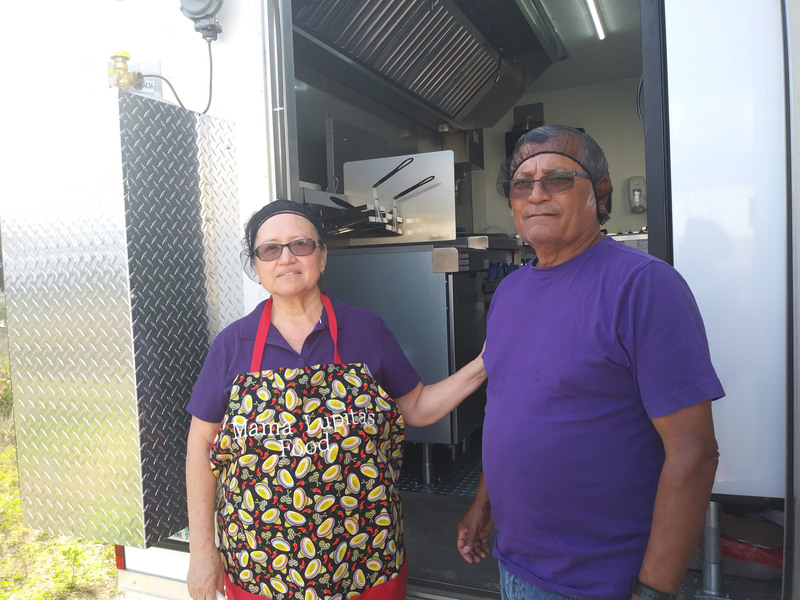 With that in mind, we thought a food truck would be the best business for us at this time in our lives.” - Conrado Gonzalez, pictured here along with his wife, Lupita. For most of their lives, Conrado and Guadalupe ("Lupita") Gonzalez have lived in Apopka, FL and worked hard in occupations involving agriculture and truck driving. Lupita has a passion for cooking good food, but their dream of owning a business seemed out of reach. Today the couple's business, Mama Lupita's Food Truck, can be seen on the streets of Apopka serving lines of eager customers. Financing for the food truck came from Self-Help CU, and we’re happy to continue serving these longstanding credit union members. Seaway Bank: This financial institution served the black community on Chicago’s South Side for more than 50 years before joining Self-Help Federal CU. People’s Community Partnership Federal Credit Union: Members and allies tell the story of a credit union that began with a call for economic justice in Oakland, CA. Choice Community Credit Union: Choice started by serving textile workers at Burlington Industries in Greensboro, NC, which at its height was the world’s largest textile company. Kern Central Credit Union: Kern Central began by serving refinery workers and farm workers in California’s Central Valley. Featuring legendary labor leader and civil rights activist Dolores Huerta. 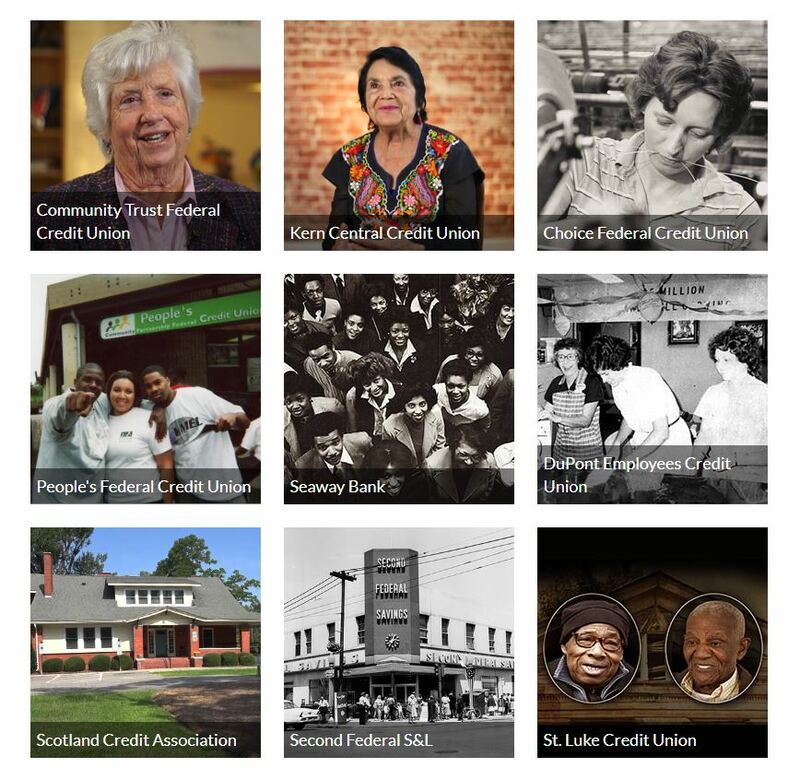 Community Trust Federal Credit Union: The renowned Apopka nuns brought better working conditions, health and economic opportunity—including a credit union—to a Florida farming community. View the entire library of our video histories in Stories from Our Vault. We make homeownership a reality for low- and moderate-income families by offering fair and affordable home loans and developing affordable housing. When Jacqueline Bryant was ready to buy a house she took her business to Self-Help CU. “I’ve been a member since I was 20 years old. I knew I could trust Self-Help to be honest and work with me, and I really like that they help single parents,” said Ms. Bryant. Her new home in Laurinburg, NC is near her job and the school attended by her three children. Undrell Johnson at her new home in Chicago. Chicago native Undrell Johnson is starting young. At 28 years old, she’s taken the leap into homeownership by purchasing her first house, with financing from the Seaway division of Self-Help Federal CU. Ms. Johnson participated in Self-Help’s down payment assistance programs, which support first-time home buyers. The young health-care worker and mother attended a local home buyer readiness and financial capability workshop facilitated by her local church, in collaboration with Self-Help/Seaway home loan representatives. 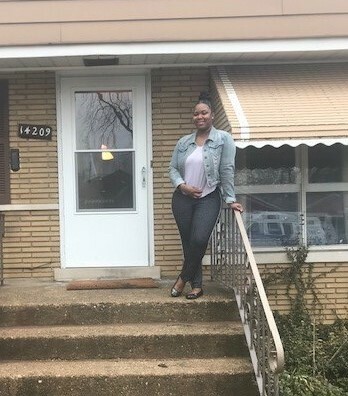 Read about the collaboration between Self-Help/Seaway and Salem Baptist Church that's working to prepare South Side Chicago residents, like Ms. Johnson, for homeownership. 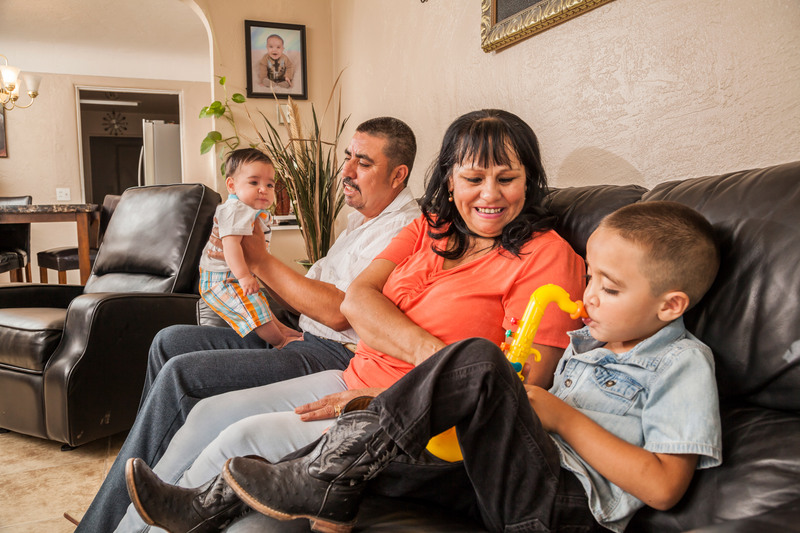 Hilda Soto first set eyes on her three-bedroom home in 2016, while renting a room in a house for herself and her three children. 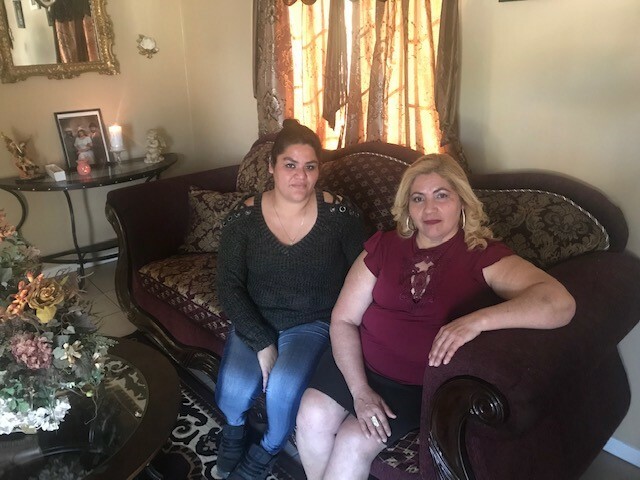 Despite building her savings to purchase the property, Ms. Soto’s lack of credit and her newly received green card forced her to finance the home through a hard-money lender. Her initial loan had a nearly double-digit interest rate and a balloon payment due in mid-2018. 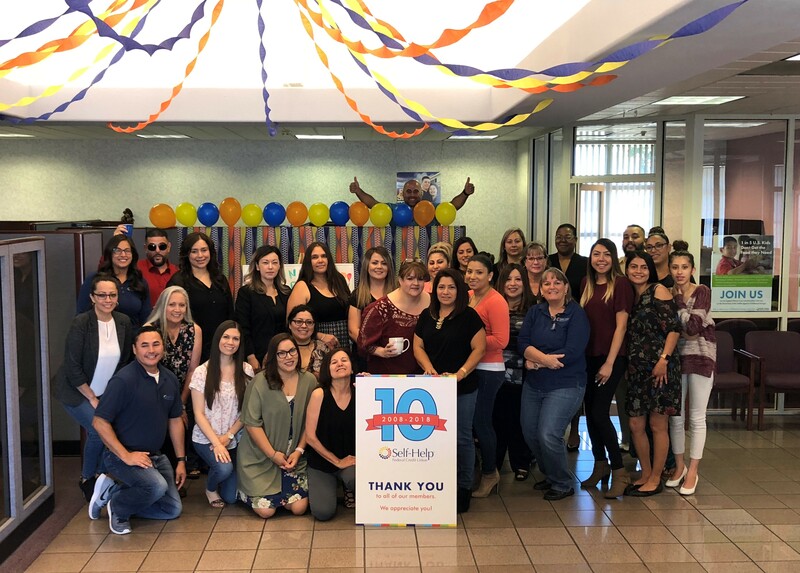 Working with staff at the Self-Help Federal CU Bakersfield, CA branch, Ms. Soto was able to obtain a fixed-rate home loan that eliminated the threat of the balloon payment and cut her interest rate nearly in half, saving her money each month. California resident and new homeowner Hilda Soto. Bettie Speight, a retired health care worker in eastern NC, and her son Alexis. 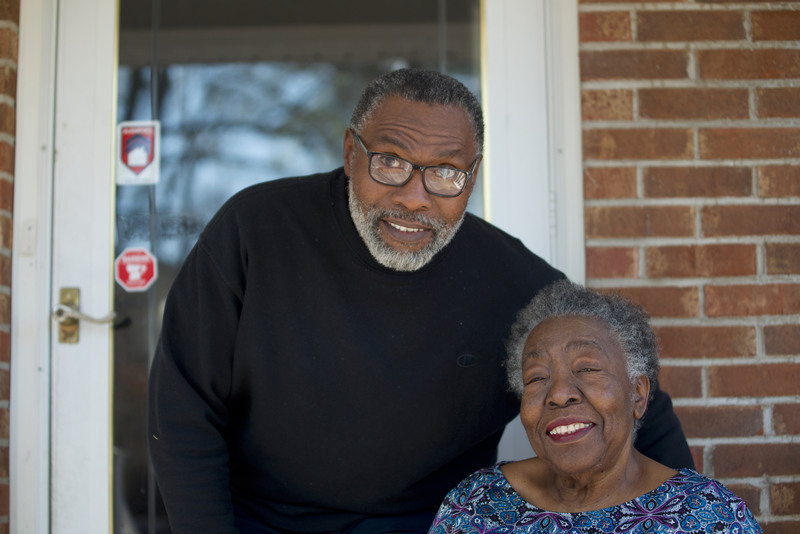 Bettie Speight bought her first home at age 76, with a 2018 loan from Self-Help CU. Working with a real estate agent, the retired hospital worker and mother of two had been looking for a fixer-upper in a desirable neighborhood in Wilson, NC. She opted to purchase a foreclosed property owned by Self-Help CU. Self-Help CU's 2017 merger with Jax Metro CU added mortgage loans to the portfolio of products offered by the Jacksonville, FL credit union. This was welcome news to long-time homeowner Tracey Carroll, who was looking to refinance her mortgage. "My husband's been a member of Jax Metro since he started working with the City of Jacksonville over 30 years ago,” said Ms. Carroll. “We decided to contact them after we found out about the merger with Self-Help Credit Union." 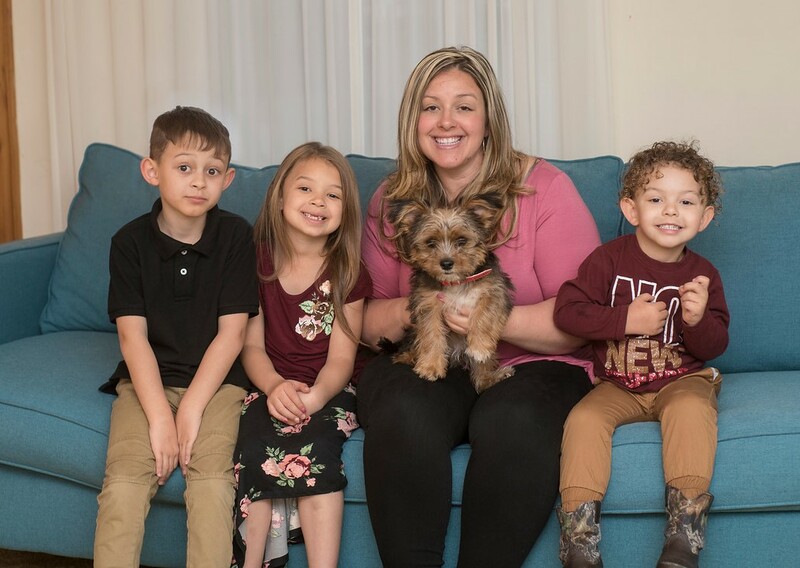 The Carrolls closed on their Self-Help CU home loan in August 2018, reducing their interest rate and lowering their monthly payment. 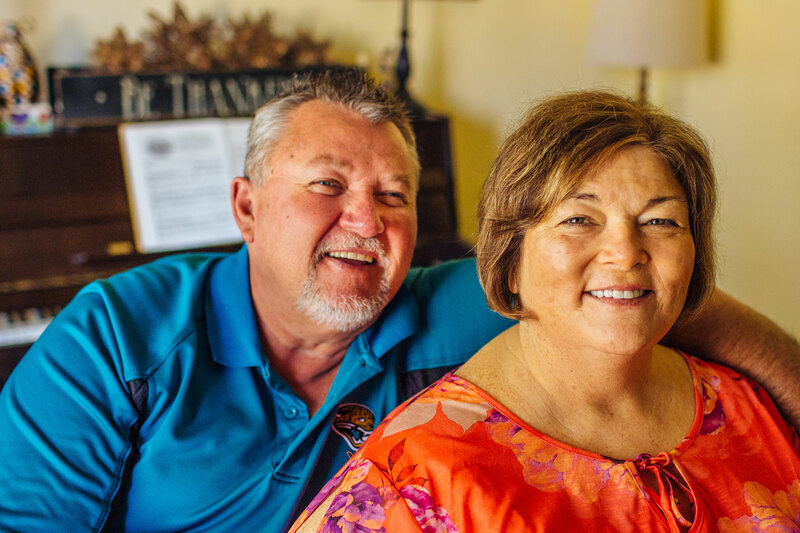 "I was happy to see we could really make a difference in their financial quality of life with a much better home loan," said their Jax Metro loan officer. James and Tracey Carroll at home in Jacksonville, FL. 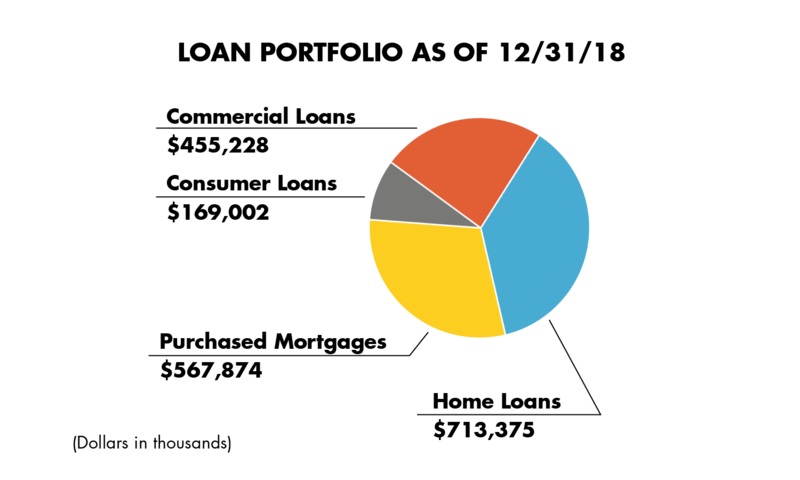 Homeowners served by Homewise, one of Self-Help's partners in our Secondary Market Program. Photo courtesy of Homewise. Complementing Self-Help’s direct home lending is our Secondary Market Program. Through this program we buy home loans made by partner lenders and community development financial institutions (CDFIs) nationwide—loans made to low- and moderate-income borrowers, minority borrowers and borrowers in low-income areas. These loan purchases provide capital to our partners, allowing them to make additional loans in communities across the country. In 2018 Self-Help purchased $205 million in mortgages through this program. We lend to businesses and nonprofits to create jobs, revitalize neighborhoods, support important community services and build community wealth. Self-Help’s growth in Southern California came at just the right time for the YWCA Greater Los Angeles. In 2018, Self-Help refinanced a pair of loans on two of the nonprofit’s largest human service facilities: the YWCA Greater Los Angeles Urban Campus and the Hollywood Studio Club. 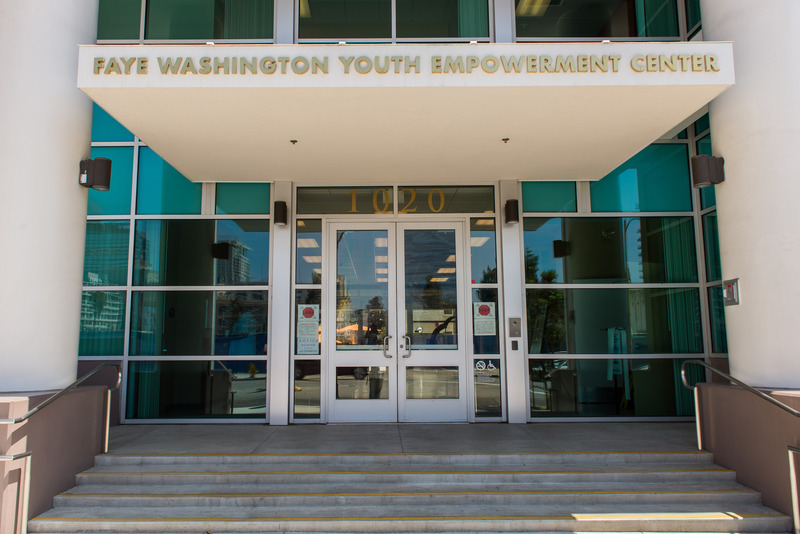 At the Urban Campus, the YWCA facilitates the U.S. Department of Labor’s Job Corps program. Each year the program provides more than 500 at-risk youth, ages 16-24, with academic and vocational training as well as health care and other social services. The Hollywood Studio Club operates as bridge housing for homeless women as well as an additional job training facility for at-risk youth and adults. Small business owner Dorian Bolden. 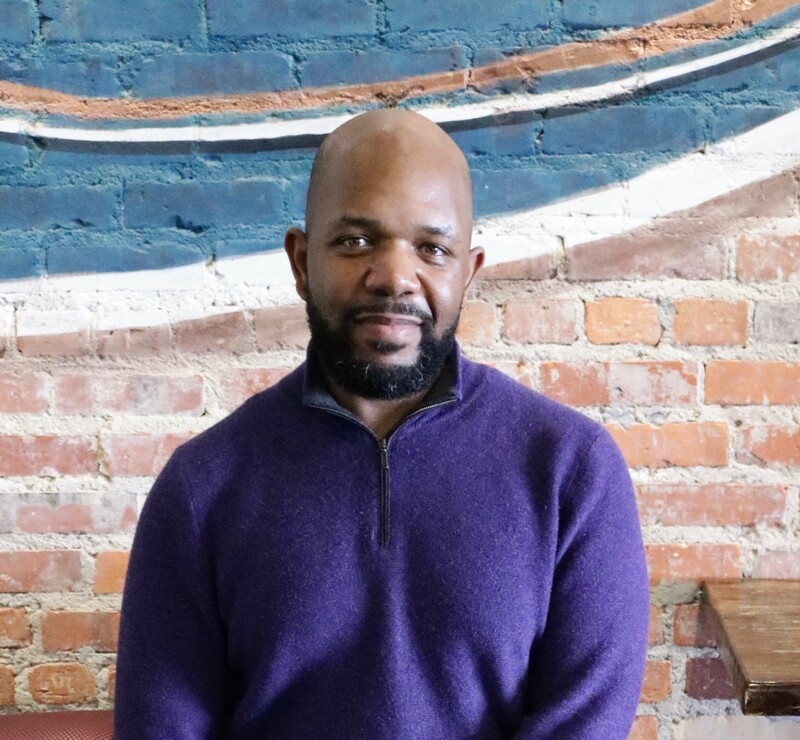 When Dorian Bolden opened Beyú Caffè in Durham, NC in 2009, his goal was to make the coffee shop “Durham’s living room.” Today, judging by his diverse and loyal customer base, he has succeeded. And now Mr. Bolden not only owns his business, he also owns the building where he operates. His move from tenant to owner was made possible in 2018 by a Self-Help Ventures Fund SBA 504 loan. Our SBA 504 loan provided Mr. Bolden with funds to purchase and renovate the downtown building. Since opening the new downtown location, Mr. Bolden has also opened a second coffee shop in the student union on Duke University’s campus. The Runway Project Oakland is a unique business training and lending organization helping bridge the racial wealth gap that often hobbles talented entrepreneurs. Self-Help Federal CU is collaborating with The Runway Project Oakland to provide financing to African American businesses in their early or expansion stages. To support Runway’s work, Self-Help Federal CU created a new loan product and has served as the exclusive lender for a pilot project in the Bay Area. Through this project, Runway has provided start-up capital of $337,000 to 18 black-owned businesses. 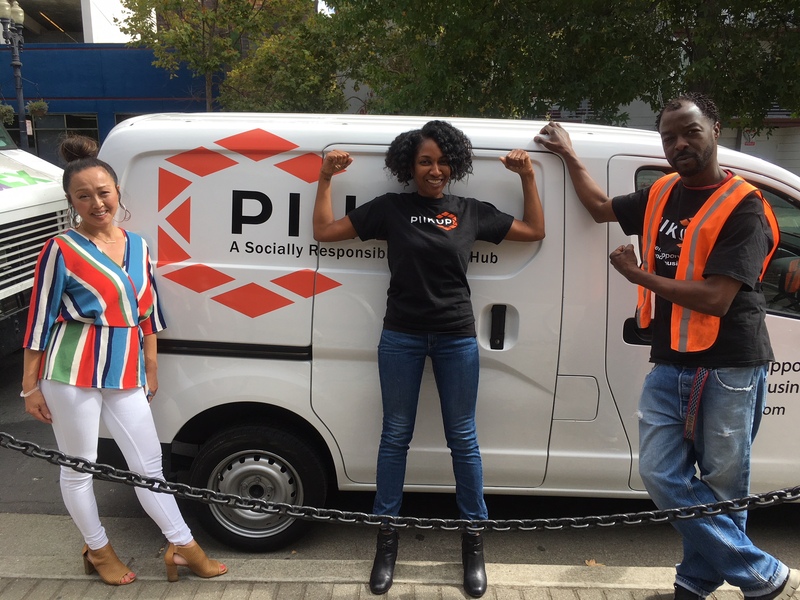 A 2018 Runway loan helped April Fenall purchase a van for her delivery service, Piikup, plus employ three people and improve cash flow. By Ms. Fenall's own account, the program’s one-on-one coaching has given her confidence that she can succeed as an entrepreneur. The Runway Project Oakland is designed to equip black Bay Area residents, like business owner April Fenall, to become successful entrepreneurs through access to capital and business expertise. 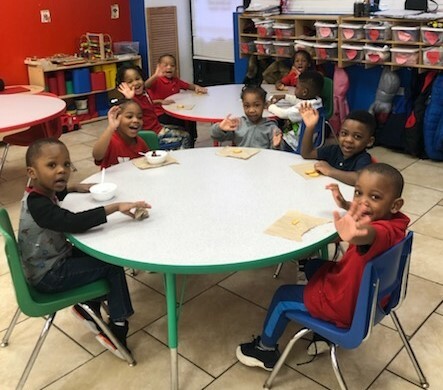 “We plan on this being the first of many learning centers that prepare future generations to be successful.” - Raymond Williams, owner of Raindrop Early Learning Center. More spaces at a quality child care center are now available in Chicago, made possible with funding from Seaway, a division of Self-Help Federal CU. The new owner of the facility is Raymond Williams, who is starting this venture with his fiancée Monique Rowell. After working as the director of a number of child care centers, Ms. Rowell had a dream of running her own facility. With help from a Self-Help Federal loan, she and Mr. Williams are excited about operating a center with capacity to serve as many as 50 children, ages two to six years old. Demand for North Carolina’s delicious produce has been a boon for Farm Fresh Produce, its employees and local farmers. Located in rural eastern North Carolina, the company operates as a wholesale distributor of sweet potatoes sourced from a number of farmers in the area around Faison, NC, where Farm Fresh Produce is based. The company has been able to expand with a Self-Help Ventures Fund SBA 504 loan. The small business loan helped fund construction of a new curing, packing and storage facility for sweet potatoes, allowing the company to increase export sales to Europe. Recently, the federal Small Business Administration named the owner of Farm Fresh Produce, Steven Ceccarelli, as North Carolina Small Business Person of the Year. Congratulations to Mr. Ceccarelli and his entire team. Farm Fresh Produce has received recognition for fair and sustainable operations. Green business practices include rooftop solar power and plans for a rainwater collection system. They also work with growers to encourage water conservation and reduced use of pesticides. View this video for the owner's story and an inside look at the company’s sweet potato operation. Elia (black dress) and Laura (purple dress) Rodriguez. Alianza Hispana is a business that offers a wide variety of services, including tax preparation, insurance, travel assistance and immigrant document preparation. 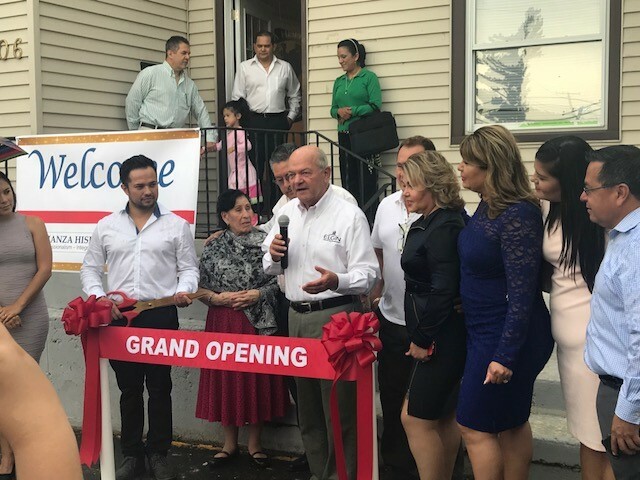 Last summer the owners of the business—Elia and Laura Rodriguez—cut the ribbon at their fourth location in the Chicago area, thanks in part to a loan from Second Federal, a division of Self-Help Federal CU. The Rodriguez sisters were motivated to start Alianza Hispana nearly 20 years ago after experiencing their own struggles with immigration. Their services are aimed at helping Spanish-speaking immigrants and other clients across the greater Chicago area. Although their business operates in three other locations, the new building is the first piece of commercial real estate that the sisters own. Stephanie Terry is a businesswoman with a healthy imagination. 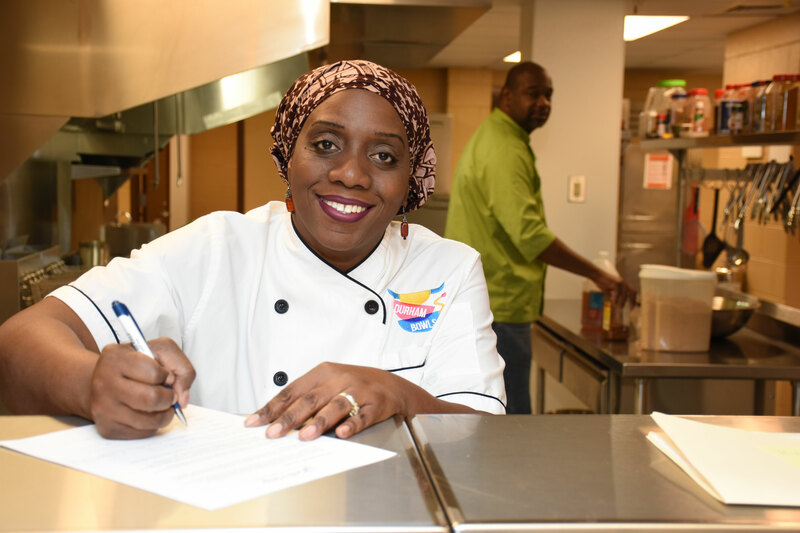 The Durham, NC chef brings a creative vegan twist to traditional Southern cooking through her catering business, Sweeties Southern & Vegan Catering. The name honors Stephanie’s great-grandmother, Sweetie, as does Stephanie’s healthy approach to food. Stephanie and husband Michael, also a chef, have been in the vegan catering business for four years. A 2018 loan from Self-Help CU provided the Terry's with funds to purchase new equipment and a cargo van. Last fall Stephanie Terry, co-owner of Sweeties Southern & Vegan Catering, received the People’s Choice Award in a local cooking competition for her signature dishes: vegan mac-and-cheese, collards and chickpea nuggets. We develop and operate real estate projects that help communities thrive — from catalytic downtown and neighborhood investments to schools, services and affordable housing. We prioritize green, socially responsive projects and work hand-in-hand with community partners to guide our vision. 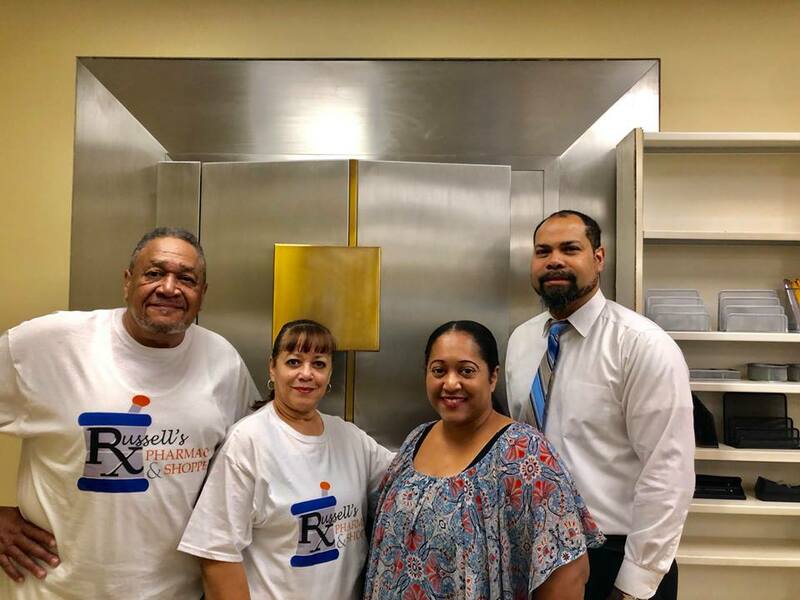 Russell’s Pharmacy & Shoppe, located in a newly renovated building, is an independently-owned pharmacy that focuses on providing a high level of care through patient education and community engagement. The Angier Business & Children’s Center (ABC Center) is a 45,000 square foot complex of office and retail space across five historic buildings in Durham, NC. The project provides high quality, moderately priced space to nonprofits and small businesses in what had been a disinvested business district. Self-Help acquired and redeveloped the property, completing renovations in late 2018. The space is now leased to tenants that include a pharmacy, a child and family-focused nonprofit, a childcare center, a fitness studio, a clothing shop and a church. These anchor tenants are all businesses owned or nonprofits run by people of color. The $11 million project was made possible by Historic Tax Credits and New Markets Tax Credits, as well as support from the City of Durham, Duke University and local foundations. Since opening in the fall of 2018, the W.G. Pearson Center has been home to Student U, a Durham, NC nonprofit. Student U works with over 400 public school students to help them build the academic and personal skills to succeed in college. The building was originally the W.G. 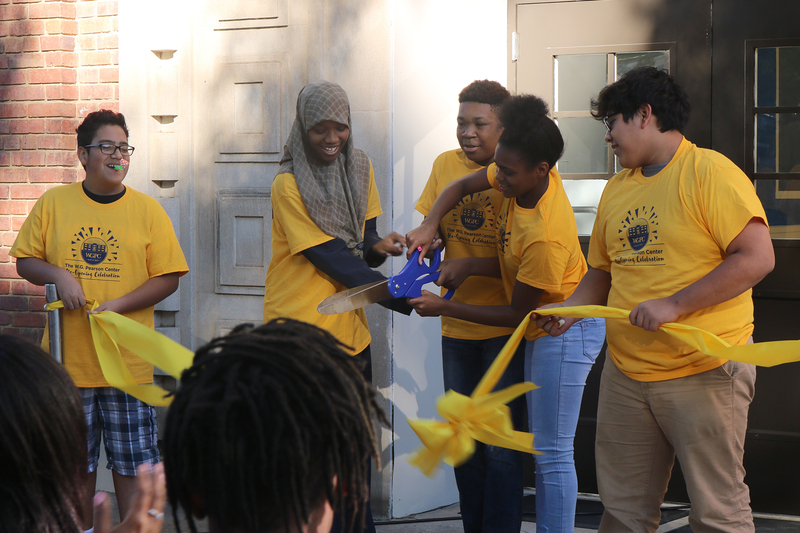 Pearson School, founded in 1928 as a school for African American students, and Self-Help’s two-year renovation project brought the 90-year-old school building back to life. The construction project was supported through a public-private partnership agreement with Durham County, and by New Markets Tax Credits and state Historic Tax Credits. Students celebrate the grand-reopening of Student U at the W.G. Pearson Center in October 2018. 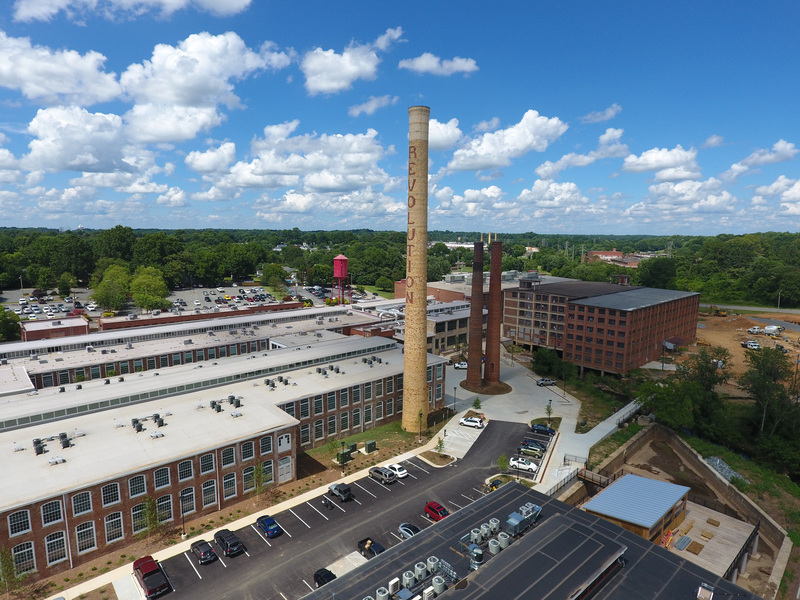 Revolution Mill is Self-Help’s largest mixed-use, mixed-income redevelopment project. Located in Greensboro, NC, the 50+ acre site is the former home of the Cone Mills textile plant, which shuttered operations in 1982. The property sat largely vacant and underutilized until Self-Help acquired the property in 2012. Since then, Self-Help has redeveloped more than 400,000 square feet of building space for office, retail and residential uses, with support from Historic and New Markets Tax Credits, North Carolina’s Brownfields Program and the City of Greensboro. In 2018, Revolution Mill acquired its largest single tenant when Kontoor Brands, a multi-billion dollar apparel company, inked an agreement to occupy more than 43,000 square feet. Kontoor is the Jeanswear division of VF Corporation, founded in 1899 and headquartered in Greensboro. The agreement will maintain the company’s historic presence in Greensboro and is expected to bring more than 130 new employees to the campus. We push for fair state, federal and local policies that promote stronger protections against predatory lending and offer more inclusive economic opportunities. In 2018, our Center for Responsible Lending (CRL) worked on the state and federal levels to stand up for fair lending policies. Payday lenders continued to push to make payday loans legal in more states, but not a single state that currently prohibits payday lending authorized it. A notable victory occurred in Colorado, where CRL partnered with allies to pass a ballot measure capping payday lending at 36% interest. For Colorado, this ends triple-digit interest rates on payday loans that previously could rise above 200%. Colorado is now the fifth state to affirm an interest rate cap by ballot and the sixteenth state—plus the District of Columbia—to protect against predatory payday lending by establishing reasonable usury limits. The campaign was led by representatives of communities hardest hit by predatory payday lending, including the NAACP, Color of Change and veterans. The reform is expected to save state residents approximately $50 million per year in excessive fees. In 2016, 76% of South Dakota's voters passed a ballot initiative capping interest rates at 36% on payday, car title and installment loans. CRL's documentary, Let My People Go: South Dakotans Stop Predatory Lending, tells the story of how a broad coalition of South Dakotans took on the well-financed predatory lending industry—and won. CRL produced the documentary in 2018 in cooperation with South Dakotans for Responsible Lending. Student loan debt has climbed to $1.6 trillion in recent years, making it the largest type of consumer debt owed after mortgages. Last year CRL had a strong focus on building expertise to address the student loan debt crisis. Predatory for-profit colleges are a significant driver of student loan debt as students who attend these schools are more likely to borrow, least likely to graduate and more likely to default on these loans. CRL issued two research reports illuminating the harms of for-profit colleges, both based on data from Florida students. CRL also led two major training sessions to help build a strong cadre of activists. The first session brought together advocates from 14 states, including civil rights, faith and legal aid allies. In December, CRL convened a day-long summit for North Carolina advocates. More than 60 participants gathered to address the growing student loan problem. Like the rest of the country, NC students are burdened by a staggering amount of debt. One in three current NC student loan borrowers is severely past due or in default. Nationwide, student loan debt totals $1.6 trillion and affects some 45 million borrowers. Summit attendees agreed on the important role of state-level laws and enforcement. They also made several recommendations, including making for-profit colleges more accountable and increasing support for Historically Black Colleges and Universities. Since the 1930s, the Federal Housing Administration (FHA) has played a central role in boosting homeownership by insuring mortgages made by lenders. 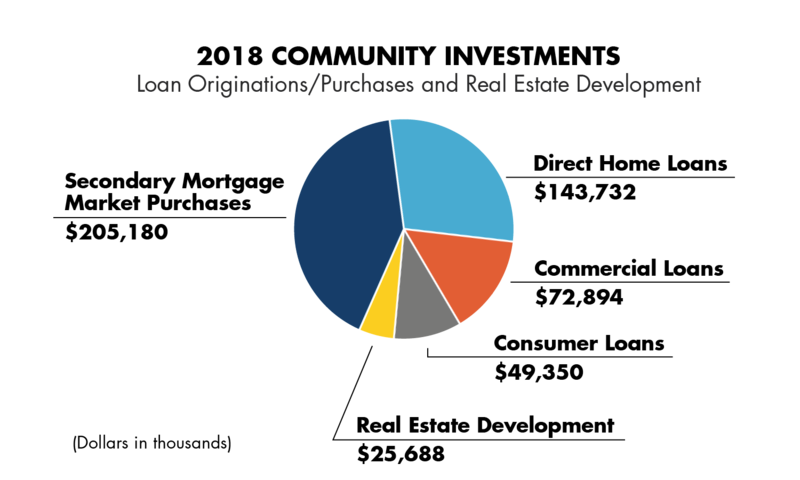 In 2018, CRL recognized the 50th anniversary of the Fair Housing Act by taking an in-depth look at the FHA in a new report: Repairing a Two-Tiered System: The Crucial but Complex Role of FHA. CRL's report traces the FHA's history, including its early years when the agency perpetuated racial discrimination by favoring white borrowers. This discrimination is a key contributor to racial disparities in homeownership and wealth that persist today. The report also finds that tight, expensive credit in the conventional market today means that the FHA is essentially the only mortgage option for many borrowers. 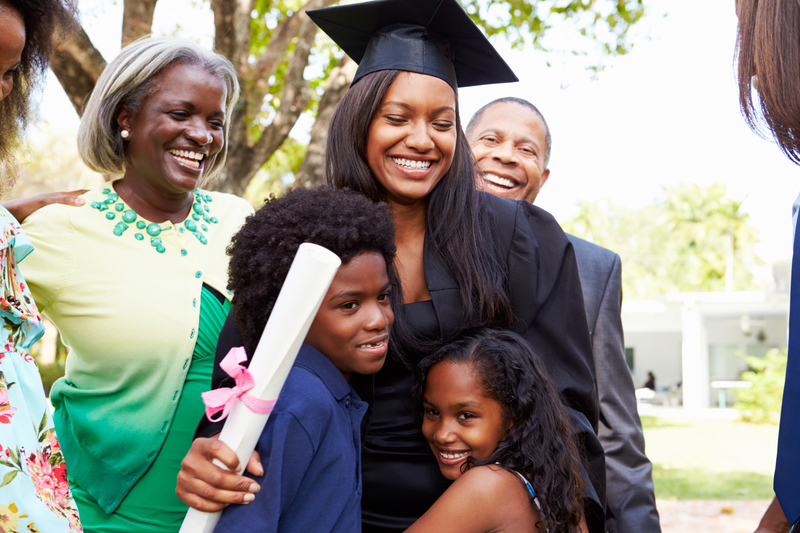 Nearly half of all black and Latino borrowers who buy a home now get an FHA-insured mortgage. The report concludes that conventional lenders should do a better job of serving all creditworthy borrowers, and that policymakers should continue to support the mission and efficacy of the FHA. 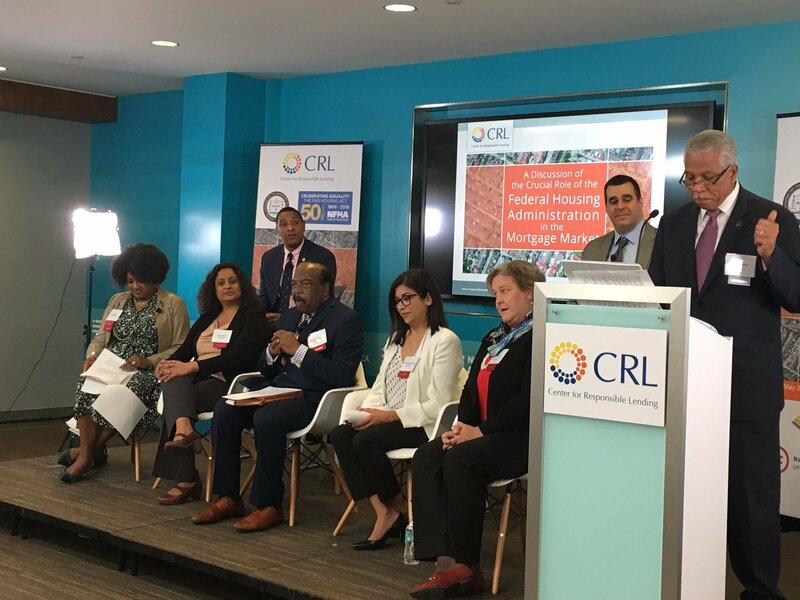 ‍In 2018, CRL joined a number of national civil rights organizations in Washington, DC to honor the 50th year of the Fair Housing Act. Other hosting groups included the NAACP, National Fair Housing Alliance, National Coalition for Asian Pacific American Community Development, the Leadership Conference on Civil and Human Rights, and the National Urban League. Our food systems lending to groups like CSU Farmers’ Market in South Los Angeles gives us a deeper understanding of how hunger, poor nutrition and lack of access to healthy foods disproportionately impact lower income and rural communities. Every five years Congress passes a Farm Bill, which shapes key national policies on food, agriculture and rural development. These topics are of vital interest to us: many of our members live in rural areas, and we make loans to strengthen those communities. We also seek to support innovative "agri-entrepreneurs" and help address food system inequities in lower-income communities. Advocating for the best policy outcomes, Self-Help joined with long-time experts such as the National Sustainable Agriculture Coalition and the Rural Advancement Foundation International. A notable success is that the new Farm Bill includes permanent mandatory funding for the Local Agriculture Market Program, home for key local and regional food system initiatives. We are building on the successes of 2018, but can't do it alone. Your investments and deposits make it possible for us to expand ownership and economic opportunity in the communities we serve. We offer term certificates, money market accounts and more; all with competitive interest rates. Contact us today to learn more. Self-Help Ventures Fund is Aeris rated.